Paul gave me a call about fly fishing Miami for some tarpon. We were able to book the charter for some night tarpon fishing. We get started and David needs a little help with his fly fishing. I gave him a couple pointers with his fly cast and he picked that right up and a couple pointers with his stripping and he was soon cast and fly fishing like a champ. While we were fly fishing, I put a bait rod out to see if we can get a bite. We hooked a nice Biscayne bay permit. 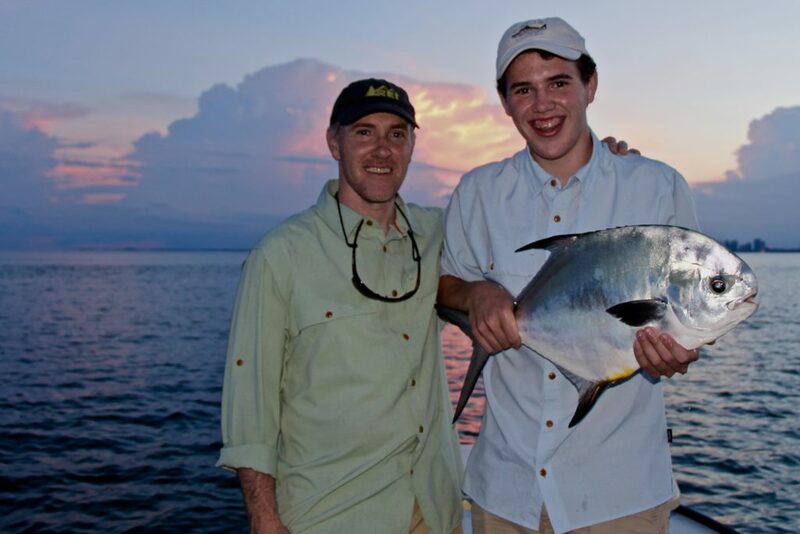 This was the first permit either David or his son had ever seen and off to a great start. But we needed to get a tarpon on the fly fishing. We head out to some inshore fishing spots and found a fair amount of tarpon there. We get a bite right away, but did not get good hook up and the fly comes out. We found one that wants it and we are hooked up solid after the tarpons first couple jumps the tarpon is still hooked up. Well this fish decides that it’s going to go through a bridge and at the same time the knob of the fly reel breaks off and wont go back on! So David uses his finger tips sticking them into the lighting holes machined into the fly reel. His is not able to reel fast enough to stay close to the tarpon. We can hear and see the tarpon jumping while deep in the backing of the fly reel. All David could do is try after weaving through several bridge pilings and getting the fly line back on the reel. We come to a place that the boat can not fit through, I grab the fly line and hand line the tarpon and pulled the tarpon through the pilings and get a leader touch. as well as touching the tarpon to the boat that is going to smash into a piling. But the tarpon pulls out another long run and gets around another piling and breaks off. So close but that is considered a caught fish but I know that David wants the photo. So we will again hunt tarpons again the next night.